In the recent past, several youngsters and non-governmental organisations (NGOs) across the country have been emphasising the need to preserve, protect and popularise traditional seeds. Today’s youth knows more about the importance of native seeds, its benefits and the urgent need to preserve it. Bioversity International, an organisation which has its headquarters in Rome and is working for the development of farmers’ welfare across the world, has also been emphasising on the need to protect seeds. The organisation’s aim is to create seed banks across the world, encourage farmers to grow crops suited for their region and offer technical advice in case of pest infestation and attack. Its Asia Pacific regional head N.K. Krishna Kumar spoke to The Wire about the organisation and the areas in which it is currently working on. What does Bioversity International mean? Bioversity International (formerly called International Plant Genetic Resources) mainly focusses on agricultural biodiversity. We believe that agricultural biodiversity sustains life. Our organisation, through research and development, helps us to provide scientific answers to our understanding of agricultural biodiversity, sustainability and the ecosystem. Biodiversity International has one of the largest banana, cocoa, coconut germplasm and manages them for the common good. In what way is it different from the National Biodiversity Authority? The National Biodiversity Authority is a government body with legal provisions to formulate and regulate biodiversity in India, not limited to agricultural biodiversity. They also formulate laws of the land and are an executing agency. In contrast, Bioversity International has a global mandate, but limited only to agricultural biodiversity. We are basically an international research organisation. What are the mandates under which your organisation is presently functioning? Our mandate is agricultural biodiversity that nourishes life and sustains the planet. We provide scientific answers to issues focusing on agricultural biodiversity. We mainly facilitate through established protocols and government regulation exchange of plant germplasm across countries. We collect, conserve, characterise and utilise valuable germplasm working in close collaboration with national and international systems. We also help countries in mitigating the spread of devastating diseases such as the recently recorded fusarium wilt of banana. We are helping the national system in identification, training and sensitisation. Our focus is now on developing an agrobiodiversity index that could be used as tool to make critical policy intervention to make agricultural sustainable.We are working on ecosystem services that help sustain agriculture. We help farmers become plant breeders by helping them choose the best variety among the native landraces. Further, we help them organise a community seed bank so that the valuable landraces are not lost but remain at the village level and readily available to farmers. Our activities are many and divergent, depending on the need of a country or a region. How is an international organisation interested preserving native seeds and reviving native varieties when even the government is trying to promote genetically modified organisms (GMOs)? Bioversity International is working towards conserving native seeds of cereals, millets and other crops which have a better adaptability to abiotic and biotic stress and thus, are adopted to climate change. This we do through a project called seed for needs (S4N). I would not say the government is promoting or not promoting GMO as this is a national policy decision. Which parts of India are you currently working in and on what areas ? We are working in Jammu and Kashmir, Rajasthan, Madhya Pradesh, Chhattisgarh, the North-East states, Uttar Pradesh, Bihar, Karnataka and Tamil Nadu. Taking into account the future of agriculture and future generations, there is an urgent call to self introspect and change farming patterns. If we take remedial steps now, only then can we prevent a total damage to the ecosystem. Expecting higher yields and growing hybrids will only create new problems for the farmer. Take the case of Punjab where Bt cotton was grown. Bollworm infestation created a havoc both on the crops and on farmers’ lives. 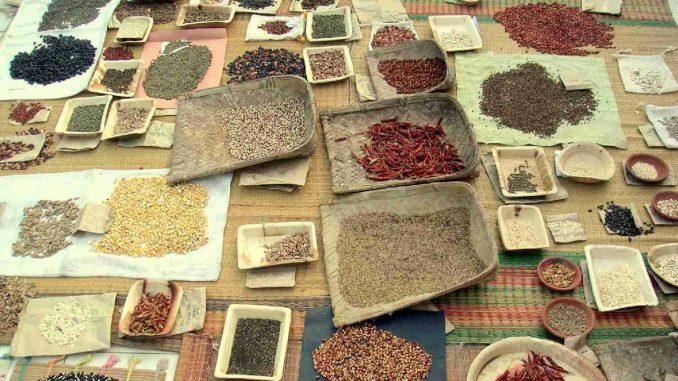 There is an urgent need to save, preserve, protect and popularise native seed varieties. Several countries have shown interest in this concept. Seeds have and are being stored and preserved by many seed saviours across the country. Even growing a small plot of these seeds can ensure that the seed bank doesn’t become empty. What steps are needed to make agriculture remunerative? We need to diversify agriculture and integrate horticulture, fisheries, mushroom and apiculture. Better support price to farmers’ commodities are needed. Information technology needs to be linked with agriculture to provide sound information, a global platform and scientific information to farmers. Water is critical for remunerative agriculture. It is important to use water scientifically to make agriculture remunerative. Export of surplus with good food safety standards, labelling and tracking is a step of remunerative agriculture. The cost of cultivation can be reduced through science-led agriculture. Critical policy decisions such as linking rivers, strict quarantine, cold storage, value addition etc are needed to make agriculture remunerative. Organic as a theory and as practice is easy, but marketing has proved to be a big problem for many. Is there any way this can be solved through your international expertise? All crops at this stage cannot be organic and some, for sure, should be organic. Some crops and regions are naturally organic. Bioversity, through a business model, can bridge the gap between the supplier, the producer, the farmer and the market. We can facilitate human resource development and training and get the best information for the benefit of Indian farmers. What according to you has been the cause of rapid agriculture production decline? Unfortunately, agriculture production must be in harmony with demographic discipline. The latter is not being given much attention. We are beyond the carrying capacity in South Asia. This puts stress on the factors of production such as land, labour, water etc. Excessive and indiscriminate use of land and water can be listed as the primary reasons for the decline of agriculture production. We need to sustain the water table and organic carbon in the soil. We seem to have forgotten that the key to sustainable agriculture is to have diversity among crops and within a crop. Unfortunately, monocropping is one of the main reasons for many of our problems. We are the largest producers and consumers of many commodities which leaves little surplus. This is not a clear case of demand and supply but a scenario where a small shortfall in production increases retail price and a little excess production leads to local glut and collapse of market price for the commodity. This is called a volatility and elasticity. The focus should be more on varieties that are resistant to pests and diseases, drought etc and thus, farmers are assured of moderate income. Why is there a large gap between lab to land regarding new technologies? In several places, farmers are not aware about some new techniques available. The transfer of technology is still not as effective as it should be. It is also said that the quality of agriculture education has declined, but I am not sure of it though! But for sure, we should produce graduates who can address the problems of farmers. Solving famers problems requires a comprehensive approach and mere technology is not always the solution. Problems of micronutrient deficiency, viruses, pests and diseases need scientific diagnosis and appropriate measures must be taken, which is lacking. Unfortunately, soil health is misunderstood as soil nutrient status. What we need is a science-led extension. We must go miles in this. Today, when more educated youth are entering agriculture, where do you think the agri sector will reach in another 10 years? Agriculture is at a crossroads. What is at stake is sustainability. Unless we correct our course, we may be able to produce a little more than today but the price we may have to pay in terms of soil health, water table, loss of biodiversity, new pests and diseases etc needs to be taken on a serious note. It is no use if we make a cosmetic progress in agriculture export or floriculture. What is needed is an improvement in dryland agriculture, better water management, scientific use of fertilisers, reduced input cost, less PHL and overall improvement in soil organic carbon and biodiversity. Our policy today shall determine this for tomorrow. Most of the present farmer producer’s organisations are wrought with corruption and nepotism. You have worked extensively on grassroots for small farmers. What is your take on this? Education and economic security shall reduce this a great deal. Things are changing and some of the schemes like direct money transfer, insurance, market reform etc by the government is a step in the right direction. It is for us to see if the glass is half full or half empty. We have miles to go in policy enactment and implementation in this regard, but what is satisfying is that we are moving in the right direction. For more details, contact N.K. Krishna Kumar at 08447284636 or k.kumar@cgiar.org.